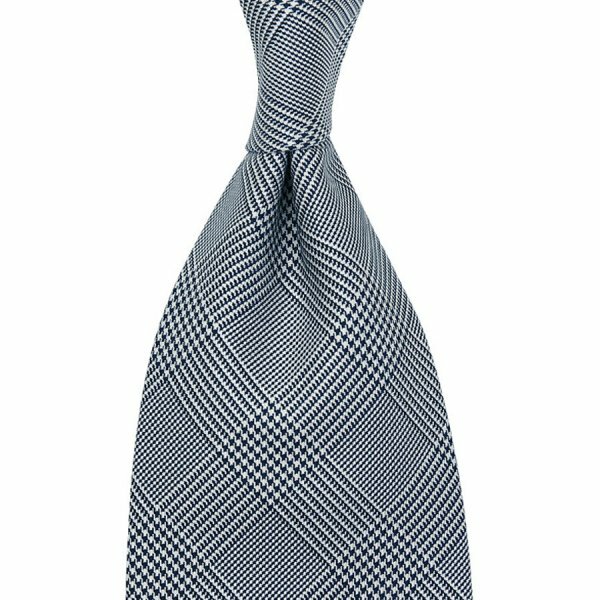 Product information "Glencheck Woven Silk Tie - Navy / White - Self Tipped"
This model here is the perfect iteration of a classic wedding tie. White and navy silk woven in a beautiful glencheck pattern. Neats like this are a standard for weddings and can be worn elegantly with a white shirt, charcoal or midnight suit, white linen pocket square, grey boxcloth braces and black oxfords. This is one of the rare occasions where formal details on a suit are appropriate, encouraged even: peak lapels, a double-breasted waistcoat, besom pockets. One of the great classic patterns, the glencheck is named after Glenurquhart Castle, where this particular pattern was first used in the 19th century by the Countess of Seafield to outfit her gamekeepers. The other popular version is the Prince-of-Wales-check, which is a glencheck with a colorful overcheck, made very popular by the bearer of the title in the early 20th century. Related links to "Glencheck Woven Silk Tie - Navy / White - Self Tipped"